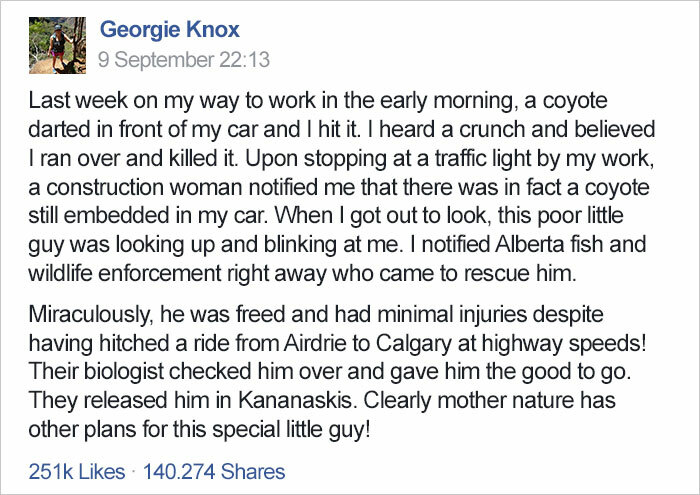 Georgie Knox of Airdrie, Canada was routinely driving to work when a coyote flashed in front of her vehicle, leaving her no time to brake or swerve before hitting it. 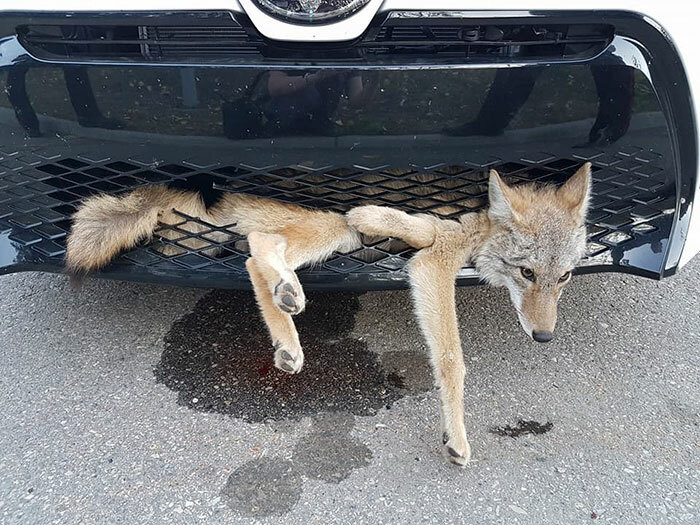 Knox notified Alberta Fish and Wildlife Enforcement and they sent a team to help the trapped animal. 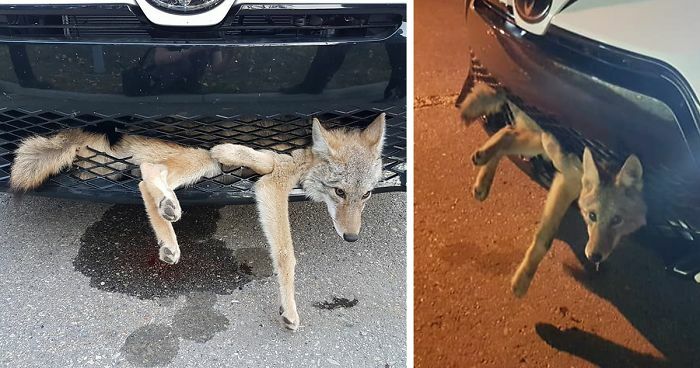 After a biologist made sure he was healthy, Knox said officers released him in Kananaskis, a park system west of Calgary. 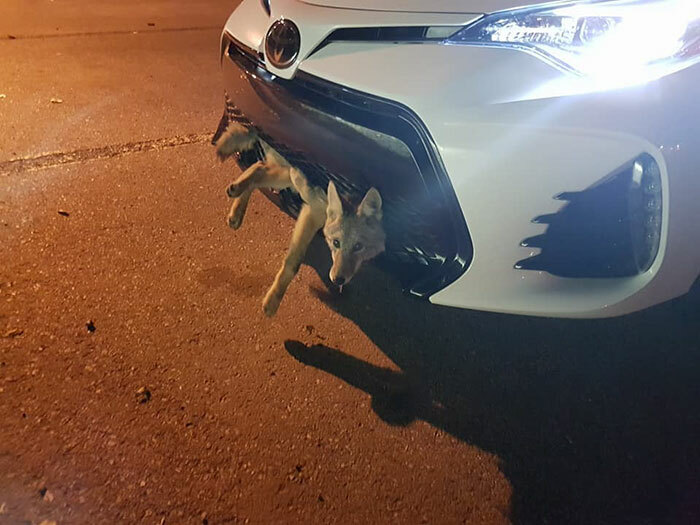 Maybe the adventures of Wile E. Coyote and the Road Runner were actually a documentary? This exact thing happened to me, but with a pigeon. It flew in front of me, I couldn't stop in time and felt the impact. When I got out to check, it had punched a hole in my plastic grating. It poked its head out, wriggled out of the hole, ruffled its feathers, walked away and then flew off! Leaving me looking extremely perplexed next to my car. You can't stop on the motorway unless you absolutely have to, or if you have a death wish. She should've stopped. Right after she heard those crunched sound. You do realise that on highways and such, you really can't stop unless absolute emergency. So unless she wanted to die or get others killed, and had half a sensible mind, she did right to not stop. You do realize that highways frequently have sidepaths for cars to stop on emergencies. She said it was early in the morning, she didn't say it was on a highway, decent people would pull over and stop. Have you taken your meds today? You sound a little hysterical.